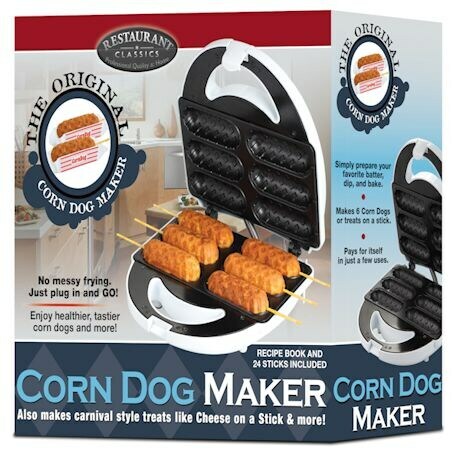 Now you can bake, not fry, the American classic corn dog! Bake carnival style corn dogs right at home! Enjoy a healthier, tastier corn dog. Simple prepare your favorite batter, dip them in ,, place on the rack and make this delicious treat six at a time. The best part is that there is no messy frying. Just plug in and go! Includes a recipe book and 24 sticks. 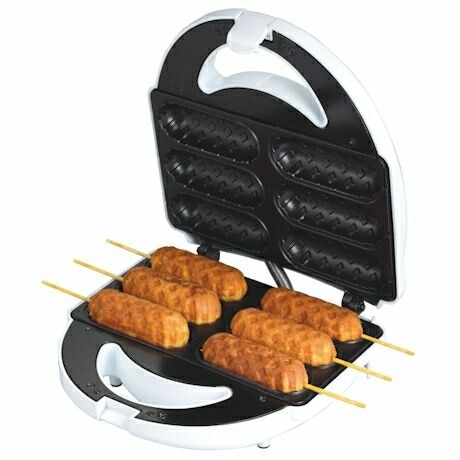 You can make other items like Cheese on a stick, pizza on a stick or even Snickers on a stick! Great for parties or just a quick and easy lunch or dinner. 9 1/2: x 9 1/4" x 4"